More Washes ? 5 extra uses compared to our 25 wash bottle. 74% less plastic than our 25 wash bottle. Tough on stains, with colour and fibre care. Works efficiently at lower temperatures. 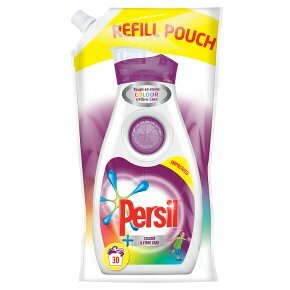 Apply for your free stain remover dosing ball at Persil.com. Powder, capsules and tablets are also available in the Persil colour range.What does it do? It?s possible to get an effective stain remover whilst doing your bit for the environment. Persil Small & Mighty Colour Eco Pack has 74% less plastic compared to the 25 wash bottle so you can help us reduce unnecessary waste. Each pack has Wash Booster technology combined with our Colour Protect to give you powerful stain removal, without letting the colours fade. So your little ones can keep wearing their favourite outfit without you worrying about the mess. How do I use it? Use the Eco Pack to either refill your old bottles, or store in the pack and pour straight into the dosing ball when you need it. If you can?t find your dosing ball, you can order a new one free from www.persil.co.uk. Simply pour washing liquid into the ball (check the bottle as this changes with load size) then place the filled ball on top of your laundry. Don?t use this washing liquid with silk, wool or any delicate fabrics. Fabric care. Check care labels first. Wash dark colours separately. Check colour-fastness before pre-treating with neat liquid. Do not use on silk and wool. Don't wash flame-resistant fabrics above 50°C. Stain Eraser Ball not recommended for combined washer dryers. Unilever recommends to wash at low temperatures such as 30°C. For handwash, dilute 17 ml detergent in 5L water. The Stain Eraser Ball is not a toy. Keep away from children. Warning.<br>Causes Serious eye irritation. Causes skin irritation.<br>Harmful to aquatic life with long lasting effects.<br>Keep out of reach of children.<br>IF ON SKIN: Wash with plenty of water. If skin irritation occurs: Get Medical advice/attention. IF IN EYES: Rinse cautiously with water for several minutes. Remove contact lenses, if present and easy to do. Continue rinsing. If eye irritation persists: Get medical advice/ attention.<br>Avoid release to the environment.<br>Dispose of contents/container in accordance to national regulations.<br>As we are always looking to improve our products, our formulations change from time to time, so please always check the product packaging before use.